8.77 points at 81 votes (rank 7). Gamebase64 10 May 2005 - "Classic!" Bub and Bob, the two small brontosaurus from next door are really angry. Indeed a meanie has kidnapped their two girlfriends and hides them in an underwater cave. The two now need to go through exactly 100 of such caves until they have wrestled their brontosaurus females from the hands of the evil Baron of Blubba. In each of the 100 caves different monsters are about. When touching a monster the two lose one of their lives. Fortunately, the brontosaurus have the peculiar ability to make stunningly big bubbles unter water. If they can enclose a monster in such a bubble and let the bubble burst, the monster is knocked out. It then turns into a bonus item, which you should collect as fast as possible to get points. Every now and then also other items appear, extra symbols which cause strange effects when collected. They may cause a saurus to walk much faster or to make bubbles faster, the whole cave to turn into bonus items, the saurus are placed into another cave or they are just bonus points. After a certain playing time, if not all monsters are caught, the chief monster "Baron of Blubba" appears. You should not take too much time to clean the level. A 2D-screen per level (every level one screen, no scrolling), cute, fluently animated sprites, corresponding background music and FX. 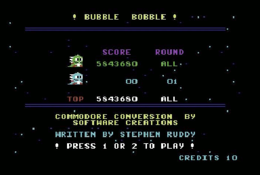 The conversion for the C64 including the level design and the colouring corresponds - except for a few odds and ends - to the arcade classic with the same name. During the game you can change from 1- to 2 player mode by pressing the space key. If in the 2 player mode the display shows "Game Over" for one player, he will get new lives by pressing the fire button, as long as there are still credits left. However his points are set to zero. If for both players at the same time "Game Over" lights up in the display, The game might end although there are still credits left! If collected E,X,T,E,N,D, you skip the level and get an extra live. Extra lives reaching 30.000 - 100.000 - 400.000 - 1.000.000 and 2.000.000 points. When both players take a power up the same time, both get its powers. If a player as taken a bottle and both player collect the same number of bonus items, both players will get the highest number of points. By collecting the umbrella you can skip 3 or even 7 levels. If the clock is collected the time until the meanie Baron of Blubba appears is extended. The nut releases a snake , which takes everything away on its way. The cross has different effects depending on its colour. Yellow cross: Bub or Bob shoot fire balls with big impact. Blue cross: The monsters turn to jewels. Per jewel collected you get 10.000 points. Flashing cross: The monsters get destroyed. Three great flashes are fired which you should collect. Huge bonus symbols count 10-fold. 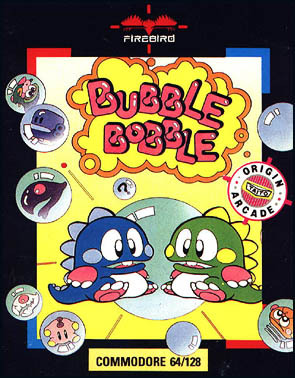 Some levels require to jump higher than normal.In multiplayer mode, one player has to spit bubbles while the other player jumps on them (jump on the bubble and then direclty on the higher spot or else the bubble will burst). This is more difficult in singeplayer mode. If no life has been lost until level 20, 30, 40, 80 and 90 instead of the extras a door appears. If you touch it, you get into a bonus level filled with diamonds, where you can collect 432.000 points and then get to level 22, 32, 42, 82 and 92. If still no life has been lost until level 50, a white door will appear which teleports you to level 70(!). On the 100th stage you first have to get the pots with the flashes and then throw the flashes from the bubbles towards the enemies. If you have made the 100th stage, you get about 1.000.000 points. 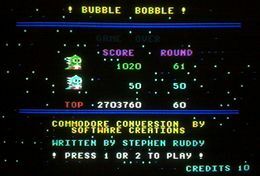 In the arcade version, when you beat the game with two players you will be presented with ending credits (with the music from the C64 title screen) and a secret code to activate the more difficult super mode. The ending credits and the super mode have been omitted in the C64 version. The C64 ending is in fact the Bad End from the Arcade version, when it is beaten with only one player. 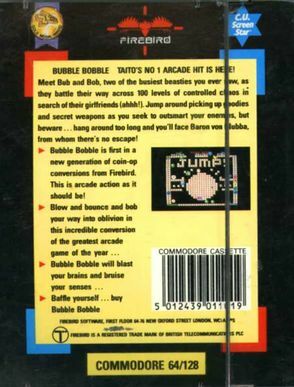 To challenge other enemies who shoot fire balls, press the following keys when the title screen appears: [S] [U] [P] [O] [R] [commodore key].If the side of the screen turns red for a short period of time, start the game. There´s a trainer version of the game on Remember (Release 161). It includes different training modes (look at screenshot). Sledgie: "Funny arcade game. I like that you can play it twosome at the same time. It gets 8 points out of 10 from me, because it is converted very well as a C64 version." Guybrush: "Absolute highlight of the C64 era by the great fun factor. You bet it gets 10 points from me ;o)"
FXXS: "Cute game with addictive potential, unfortunately there is only this one piece of background music and in the higher levels not only surviving gets harder but the points are also rather meagre. Also the influence of random symbols is a bit too high, thats why I "only" give 9 points for the single player mode." o.b./TRSi: "An addictive game that I still play today in the 21st century for a few hours. I also knew the arcade machine and I have to say, I cracked this game with pleasure: it was EVEN BETTER than the machine. Still today I own the original." Shmendric: "The sound, I still have it in my mind! What a saucy catchy tune. Next to Wizball, Archon and Goonies the best multiplayer game. Quapil: "For me just THE game. I still have the tune as a ring tone, a mate and me played it day and night at that time until we practically could play it through blindfolded and without any mistake. 10/10 points!!" 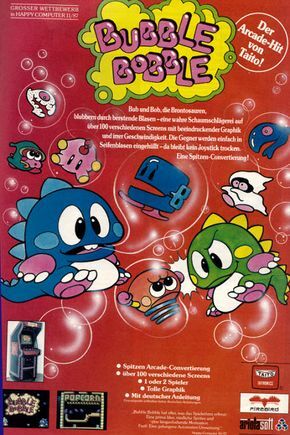 Bubble Bobble II is an inofficial SEUCK sequel which was never released. See C64Games.de - Game No. 4197 . The official sequel is the game Rainbow Islands. 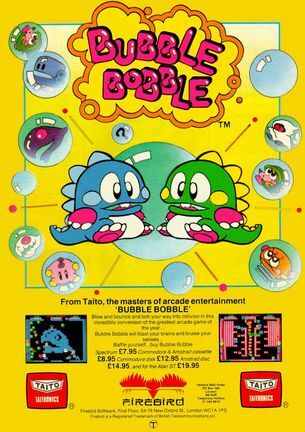 Bubble Bobble in the Killer List Of Videogames. This page has been accessed 32,686 times.